If you can love a book after having gone through a box of tissues, then the author has done something very right. Carol Bradley is that author, and the book is Last Chain on Billie: How One Extraordinary Elephant Escaped the Big Top. Even for those who already know about the desperate plight of captive elephants, this book is a gut-wrenching account of how profoundly elephants suffer in captivity. Yet after reading how these animals can recover if given the chance, I finished the book feeling ready to take action for elephants. The book alternates between chapters of modern-day elephant exploitation and historical accounts of how we started using elephants in entertainment, including their capture from the wild, their grueling transport to the U.S., their high mortality rates, and the public’s fascination with these gigantic beings. While the book does go into detail about Billie’s grim existence, the overall theme is about elephants in the zoo and circus industries. Bradley tells us about the habits, histories, and personalities of many individual elephants, not just Billie (a female Asian elephant). Billie’s history is particularly abysmal, but she also represents all the elephants who have known nothing but misery in captivity. What also stands out is the way that circus families are so entrenched in the business. The very same people PETA protests today are the descendants of the families who ran the circuses of old: Carson & Barnes, Kelly Miller, Tarzan Zerbini, and, of course, Ringling. Little—if anything—has changed. These circus clans are still beating and chaining elephants and staunchly defending their practices, just as their ancestors did. Bradley also throws open the curtain on how inept the U.S. Department of Agriculture (USDA) is at imposing meaningful penalties and punishments, using John Cuneo and the Hawthorn Corporation as the case study. Elephants at Hawthorn were beaten and housed in dark, filthy barns. Many were sick with tuberculosis and life-threatening foot problems. They were chained, front and back, for months on end—and in many cases, the USDA just kept delaying any kind of meaningful action. Cuneo was completely disinterested in why Billie was “hostile” and aggressive and attributed it to the idea that she just wasn’t “being a pleasant elephant,” instead of her life of beatings and chains. After Billie rebelled and attacked a trainer, she was taken off the road and lived in chains in a dark Hawthorn barn for 10 years. Even when Cuneo was finally forced to relinquish 15 elephants, including Billie, he was still allowed to keep his exhibitor’s license and keep tormenting 87 tigers and one lion. Cuneo is still in business, renting out big cats to this day. 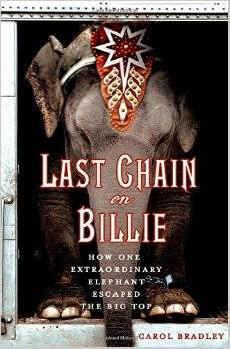 Last Chain on Billie is ultimately a book with a happy ending for some elephants. Billie, for example, was retired to The Elephant Sanctuary in the U.S., where, after a considerable amount of time adjusting, she at last allowed the chain attached to her leg to be removed. But this book is also a wake-up call about how many elephants have suffered in captivity and how many still suffer profoundly today. And it’s a call to action.